North Judson dates its beginning to 1859, when the P.C.C & St. Louis railroad was built. Not, however, until 1871 were any Catholics found here. 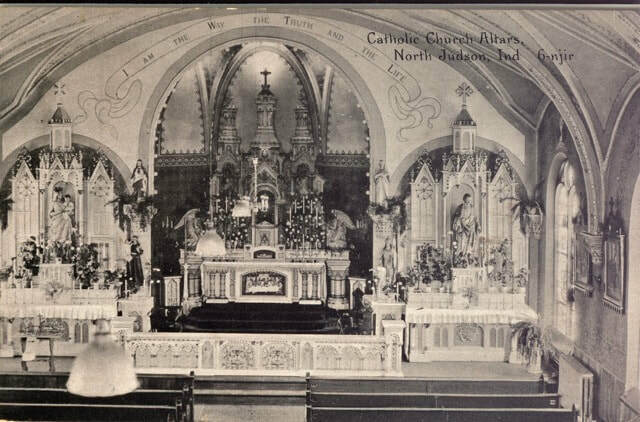 The progress of Catholicity was slow, and it was not until 1881, that an effort was made by the Catholics to erect a place of worship. Prior to this, the Fathers of the Most Precious Blood visited the few Catholic families infrequently. Mass was celebrated in a building situated on East Main Street, North Judson's first hotel. Father Dominic was the first priest to have regular services and they were every other Sunday, as he had to journey to North Judson by horse and buggy from Wanatah. He would arrive on Saturday afternoon and stay overnight at the John Komas home, located on Wilson Street, one block south of State Road 10. The site for the church was donated by Louis Keller and his brother Jacob. The edifice was a frame structure with a hip roof, 30 feet wide by 35 feet long, with a small cross on the front. Within a few years, a bell was purchased and placed on two hand-hewn oak posts, about 30 feet high. These structures were in approximately the same spot where the present church now stands. In 1884, Father Frericks was the next priest to serve the parish, also traveling from Wanatah and staying in the Komas home every other Saturday night. The trips were very difficult during the winter, and the bell would be rung to let people know for sure that Mass would be held. Finally, in 1887, Father Casmir Kobylinski became the first resident priest. During his five year stay, Joseph Rozhon and Jacob Jachim with the help of a few other parishioners, erected a steeple over the choir loft to house the church bell. The Church, as it looked then, is pictured above. 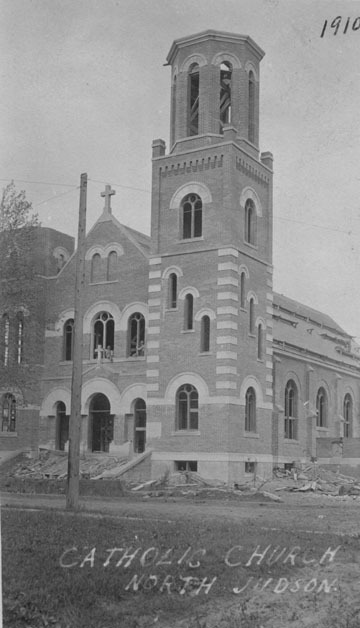 On Easter Sunday, March 27, 1910, after Mass, the men of the parish began tearing down the frame structure to make room for the present church. 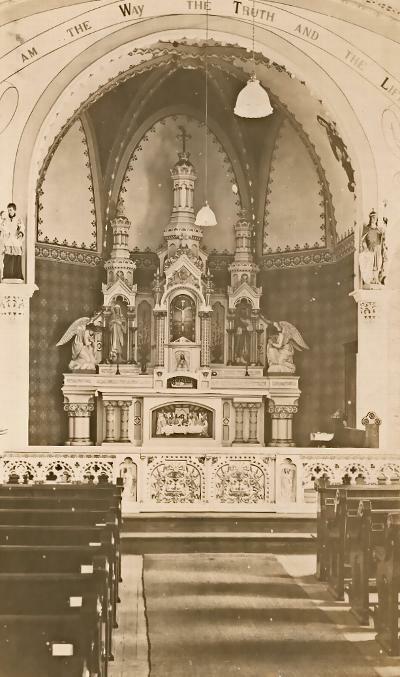 During this period, Mass was said in the Koza building at the corner of Sycamore and Lane Streets. Laying the Cornerstone May 21, 1910 The following article is excerpted from the parish Diamond Jubilee booklet published in 1956. 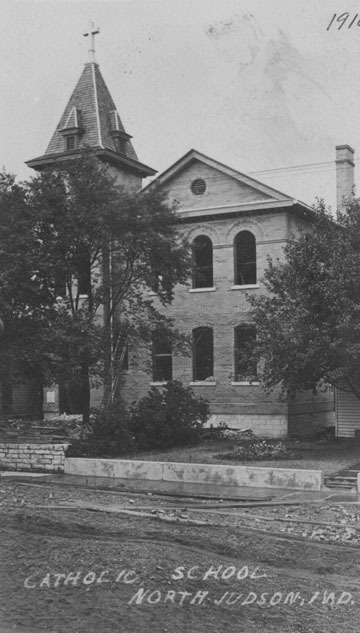 Prior to the spring of 1910, solicitations for the building of the new church and school had been going on for some three or four years, and an accumulative fund of about five thousand dollars had been compiled. The Church committee was comprised of Frank Vessely, Frank Dalka, and Joseph Dolezal, men of good sensible and prudent minds, as can readily be seen by the pretentious edifice that was erected for housing Our Lord. The building of solid brick, was built on the exact site of the old structure. The high ceiling sanctuary and the main body of the church with most elegant stained glass windows, and the front vestibule over which the choir loft was flanked on each side by steeples in which one has the bell, and the other the Baptistry, is the complete floor plan of our church. The school was also started at the same time, consisting of four large classrooms. This tremendous undertaking cost in the vicinity of $45,000, however this does not include the many hours that were donated by all parishioners of labor, as well as their hard worked teams of horses, hauling the sand from the basement, the unloading and hauling of the lumber and brick from railroad cars to the site, the mixing of cement, mortar and plaster. The corner stone for the church was laid on May 21, 1910, by the Very Rev. Louis A. Moench of Mishawaka, delegated by Bishop Alerding to perform the ceremony. 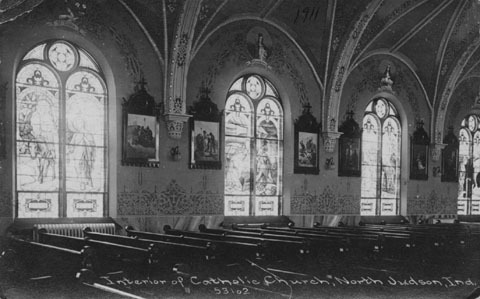 On Easter Sunday, April 11, 1911, the church was ready for its first Mass. The church was completely furnished, with the exception of the High Altar and stations of the cross. These buildings carried a $40,000 mortgage. The yoke was of very great weight and it was felt for almost 20 years.